How Dare You Not Take Expired Coupons! Bruno: Very disappointed to learn Olive Garden is no longer accepting your own $4 expired coupons, thats like throwing big advertising dollars down the drain. When we found out the coupon wasn’t going to be honored at the end of our meal and our server told us “sorry we don’t take expired coupons anymore”. How about posting it on Facebook that your no longer taking your expired coupons. Trust me we have lots of choices for italian food and this will be the last time we visit a Olive Garden to be embarrassed. FYI the 4 of used to dine at Olive Garden about twice a month. 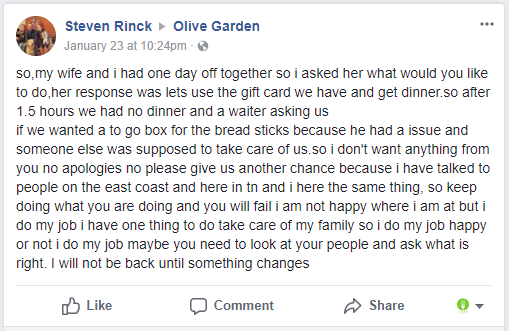 Facebook Olive Garden TROLLS you DON’T need to respond. You know who you are it doesn’t concern YOU.